At the Institute for Energy Research (IER) blog, I rebutted Yale economist William Nordhaus’s New York Review of Books criticism of a Wall Street Journal editorial by 16 “global warming skeptic” scientists, including MIT’s Richard Lindzen. (2) what the climate scientists mean when they talk of a “confidence interval” in temperature projections. The casual reader in these areas may be very surprised at what I have to report. I hope the reader will agree with me that Nordhaus is certainly inviting the reader to infer that now and in the future, the best available studies (as summarized by leading scholar Richard Tol) show that emissions of GHG will cause net damages. The above quotation is not taken out of context; this is all the information Nordhaus provides on the topic. The only ambiguity the reader can imagine concerns just how much damage GHG emissions will cause, now and in the future. Yet if we consult Tol’s paper—the very one cited by Nordhaus in support of the above quotation—we find that most economic studies find global warming will confer net benefits on humanity at least through the years 2050 – 2060. Only after we get at least another 2 degrees Celsius of warming (and that is compared to a recent baseline, not a preindustrial benchmark), do most studies in this literature say that the damages to certain parts of the world begin to overwhelm the benefits to other parts of the world. As I mentioned in my IER post, I hope the average reader will agree with me that Nordhaus’s summary of Tol’s findings was extremely misleading (perhaps unintentionally). I daresay the average person, relying on mainstream media treatment of the issue, has been led to believe that “the consensus” of experts believes climate change is right now causing incredible damage and will only get worse as time passes. And yet, the very person Nordhaus singled out as the leading scholar in the field, shows that the majority of the best available studies show global warming leading to net benefits at least for another four decades. It’s easy to misinterpret Figure 1 from [my paper] Tol (2009). I note that just because global warming might arguably confer net benefits on the world for the next sixty years, doesn’t by itself mean that no mitigation efforts should be undertaken beforehand. If the standard climate models are correct, then the trajectory of global temperatures will only respond sluggishly, even with drastic changes in emissions down the road. Thus, Tol’s clarification in the comments is perfectly consistent with my take in the original post. I wasn’t trying to draw conclusions about climate policy from that one graph from Tol’s 2009 paper. Rather, I was showing that Nordhaus had misleadingly summarized what the literature says on the impacts of global warming. Now I am not here trying to be coy. We all recognize that the political battles over climate change can become downright nasty, and it is understandable that Tol was concerned his work might be used by “deniers” to say that no government intervention is needed. In that light, I probably should have amplified the caveat (which I had only put in a footnote) to make sure Tol’s own position were clearly stated. With this straight, let me emphasize why I think this is so critical: The general public has no idea that the “consensus” (if we wish to use such terminology) of economic studies shows net benefits from anthropogenic climate change for decades. If the general public did know that, it is undeniable that public opposition to a massive new carbon tax or cap-and-trade scheme would be that much greater. We have very little idea what the relevant tradeoffs and technologies will be 50 years from now, and it’s also not nearly as obvious how to properly evaluate the “social utility” of our grandchildren against our own. The case for climate activism does indeed become much more dubious when people learn the true state of the economics literature. Yes, it is true that many of the scholars working in this field still think there is a case for (initially modest) government mitigation efforts such as a global carbon tax, but the confidence we should have in their recommendations is much lower once the time element is highlighted. To repeat my main point, and to underscore why I was so upset with his original article: The innocent reader of William Nordhaus’s treatment in the New York Review of Books would have absolutely no idea that the second description above, is the more accurate picture of what the economics literature has to say about the impacts on human welfare from anthropogenic climate change. Now we have seen just how important the accuracy of the computer simulations are. After all, Nordhaus is asking us to go along with a massive new tax to eliminate a “negative externality” that won’t manifest itself for at least half a century. Fig. 2. A comparison between modeled and observed trends in the average temperature of the lower atmosphere, for periods ranging from 10 to 32 years (during the period 1979 through 2010). The yellow is the 5-95 percentile range of individual model projections, the green is the model average, the red and blue are the average of the observations, as compiled by Remote Sensing Systems and University of Alabama in Huntsville respectively (adapted from Santer et al., 2011). 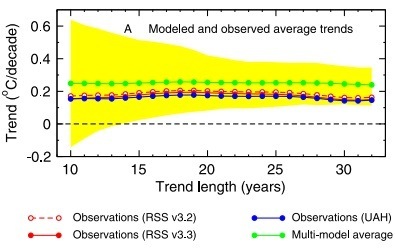 Knappenberger’s reasoning was straightforward enough: In the chart above, the green line is the average model prediction of global temperatures. The red and blue lines are actual observations (from three different sources) of the global temperature trend from 1989 through 2010, and they have been consistently below the model’s projected trend. In fact, unless observed temperatures begin rising fairly quickly in the next few years, the observed trend will breach the lower boundary of the yellow envelope. If the suite of models were accurately capturing the true climate system, we would only expect natural variability to generate such a breach (on the low side) 5% of the time. 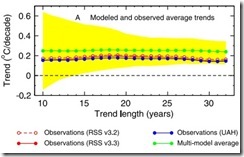 A Different View: Are the Climate Models Doing Just Fine? Indeed, this graph appears to give a much different picture from the Santer et al. graphic that Knappenberger discussed. The climate models look to be right on the money, predicting a bit too much warming in recent years but well within the uncertainty bounds. The resolution of this conundrum relies on two things. First, the confidence interval is tighter in the first graphic from Santer et al. In other words, the yellow envelope in the first chart shows the range in which the actual observations need to remain, if we only want to have a “false negative” 10 percent of the time, whereas the second chart’s gray region is more generous and will only allow researchers to incorrectly reject a correct model 5 percent of the time. The second crucial difference is that the Santer et al. graph (with the yellow band) looks at temperature trends, whereas the RealClimate graph (with the gray band) looks at single-year observations. Yes, it is true that “natural variability” and other noise can keep the suite of climate models from being “falsified” in any given year. Yet if we look at a 30-year trend, the noise should largely cancel out, with the underlying predicted trend being quite dominant. On this score, the climate models have indeed overpredicted warming, such that they are on the verge of being falsified. While contemplating “confidence intervals” in the context of climate models, something just didn’t sit right in my mind. In my personal discussions with Chip Knappenberger, it was hard to convey why this procedure seemed so counterintuitive to me. Let me elaborate on the point, because this may be an area where economists and climate modelers come with different preconceptions. In a standard economic regression analysis, we typically approach things the way one is taught in high school when learning basic statistics. Namely, you set up a null hypothesis that is the opposite of the causal relationship you (the researcher) actually think exists. Then, if there is an apparent relationship in the data (such that you get a positive value on the coefficient for a certain term in a least-squares regression, say) you can see if the result holds up at a 90 percent, 95 percent, or 99 percent confidence interval. Yet in charts of climate model projections, the “confidence interval” works the other way around. Here, the higher the number, the less confident we can be that an apparent match between the model and nature is due to the underlying accuracy of the model. To put it in other words, here the null hypothesis is that “this suite of climate models is accurately simulating global temperature.” Thus if we make it harder to reject the null (by ramping up the confidence level), then it gives more wiggle room for the models. Specifically, the “95% range” in the second graph above comes from looking at all of the observed “runs” of the suite of climate models, and then plotting the gray boundary that captures the realizations of 95% of the runs centered around the average. Ironically then, the less agreement there is between the individual climate models, then the wider the gray zone would be, and the harder it would be for Nature to “falsify” the suite of climate models. 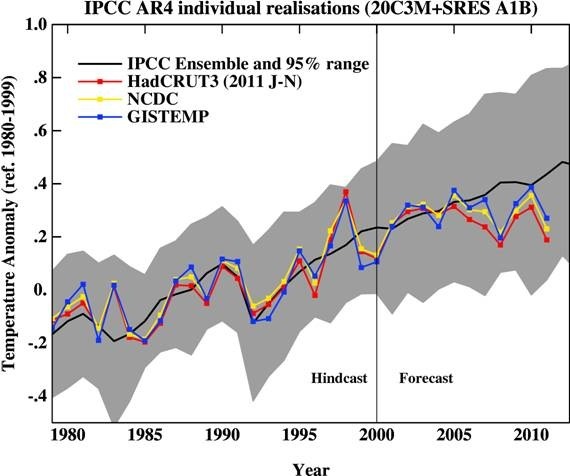 Now to be fair, there are rational vetting procedures that the IPCC uses, to determine which climate models are included in the set, the various runs of which are used when constructing these graphics. But to make sure the reader understands the crucial point I am making: Suppose for the sake of argument that one particular model accounted for 3% of the total simulated runs, and it predicted global temperature anomalies of 20 degrees Celsius from the year 2010 forward, while another particular model accounted for a different 3% of the total simulated runs, and it predicted global temperatures of minus 20 degrees C from 2010 forward. In this (absurd) situation, the RealClimate post would show a massive gray zone covering the “95% confidence interval,” and (barring an asteroid collision or a massive change in the sun), it would be inconceivable that temperature observations would fall outside of this range. Yet that would hardly shower confidence on the suite of models. Their interpretation is almost the exact opposite of the statistical tests performed in other disciplines, such as economics. This difference isn’t because the climate researchers are charlatans; it flows from the nature of their task. Even so, it’s crucial for everyone to be aware of this difference. The scientific modeling of climate change, and its possible impacts on human welfare, are very technical areas requiring years of study to master. When experts try to summarize the fields for the layperson, they sometimes present matters in misleading ways, however inadvertent. 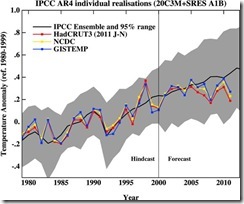 William Nordhaus’s treatment of the economics literature, and RealClimate’s discussion of the accuracy of climate models’ temperature predictions, are good examples. To amplify your point about future technologies: People have worried about the impact of climate change on malaria for two decades. There is indeed reason to believe that malaria would be more prevalent and more intense in a warmer and wetter world. At the moment, though, malaria incidence is falling rapidly because of a heavy investment in primary health care. That does not mean we need not worry. Malaria numbers fell in the 1960s too, but then the powers that be lost interest. This time, though, there is a promise of a malaria vaccine. One further instance of “reductio ad absurdum”, mentioned but not pursued above. A carbon tax, in any form, does not directly reduce carbon emissions, it merely negatively incentifies the emitters. Carbon emissions are reduced by replacing carbon emitting facilities and equipment with facilities and equipment which do not emit carbon, or emit substantially less carbon; or, by capturing some or all of the carbon emitted by facilities and equipment. Carbon emissions can also be reduced marginally by conservation (doing less with less) and efficiency (doing the same with less). Replacing facilities and equipment with low/no emissions facilities and equipment requires significant capital investments. A carbon tax, in any form, merely adds cost on top of the investment requirement, thus increasing the total expenditures required to reduce emissions; and, thus, the increased costs imposed on consumers of the products or services provided by the emitters. A carbon tax, in any form, enriches government at the expense of the governed. From the perspective of government, that is a desirable outcome; from the perspective of the governed, not so much. Keep up the good work. You’re the only person I’ve seen that has tried to estimate the economic impact of greenhouse gases in a non-biased manner. I cite your 2009 meta-article a lot, so I’m glad that you were able to publish it in a journal. Nordhaus’s worst mistake, IMAO, is assuming that the “ideal policy” calculating from some economic theory, is the same thing as the best possible policy in the real world. This is no minor point: Nordhaus argued that the climate skeptics were wrong to point to the fact that according to his analysis, a policy of doing nothing for several decades is very close to the “ideal” carbon tax (which is quite small. Nordhaus insists that the small “improvement” is good enough reason to advocate doing something rather than nothing. This is politically very naive. In the real world, the ideal policy is not possible. Nordhaus’s argument would only make sense if the government policy was going to be determined by angels that decide what level to set a carbon tax exactly at the level it has been determined to be “optimum”, rather than at whatever level politicians feel is appropriate for their actual agendas as human beings, not angels. So the skeptics were actually being sensible in pointing out that doing nothing is better than real world (not academic fantasy game) proposals that politicians might actually consider. If one took this into account, advocates of the “ideal policy” of “doing a little, not too much, but not nothing” would be wrong even if there were going t0 be as much damage as Nordhaus assumes. Silly question, but is it really necessary to restrict growth? Would it not be possible to substitute income taxation with carbon taxation without loss of future wealth? Would the efficiency gain of lowering income taxes not offset the temporary efficiency loss of carbon taxation or is that empirically utterly implausible? One cannot say that the effects of taxes on the economy may be equivalent to one another simply by design one to bring in similar revenue to the other, so one cannot make the two equal and then exchange them and have no effect on the economy. Similarly, one can’t really design the exchange of the two to be a certain “net benefit”. Both taxes have different effects on the redirection of investment from the place that the market would otherwise tend to have it go. Both then encourage malinvestment but there is no real way to compare the economic losses from one redirection of investment from the other, no way to construct a perfect policy where we have no net negative impact on the economy by trading one bad policy for another. Even if prefect economic calculation were possible-it’s not-for it to be practical would again require that politicians were angels who would carry out the fantasy “perfect policy” were by the harm of a carbon tax is exchanged for the benefits of eliminating income taxation to some extent, leaving everything perfectly balanced. And anyway, there is something quite perverse about replacing the government’s primary revenue raising measure with what constitutes a “Sin Tax”-such taxes are designed for the purpose of limiting the action they are taxing (in this case, emitting CO2) and thus, if they worked as intended, would eliminate their own revenue. Climates changes net benefits? You are kidding, right? The statiststical connection between extreme weather, not a benefit, and climate change is pretty well established by NOAA and other groups. A vaccine, genetically altered mosquitoes, treatment drugs, indoor residual spraying, bed nets. There are a host of reasons why it can be predicted with virtual certainty that the number of deaths in the year 2050 or 2100 from malaria will be a small fraction of those in the year 2000, regardless of how much the world warms between 2000 and 2050 or 2100. In fact, it is probable that malaria will be eradicated by 2050 or 2100, regardless of how much warming occurs by 2050 or 2100. Liar, nobody “lost interest.” Malaria numbers fell in the 1960s, but a gang of left-wing hysterics convinced policy-makers that DDT was a greater danger than malaria. And perhaps it was, to them. Malaria outbreaks occurred north of the Arctic Circle in Finland. It is not a direct function of temperature, but of malaria control, which Western nations began to implement even before the recognition of DDT as an insecticide. Around 1950, British colonial doctors discovered malaria could be controlled in the tropics by the indoor spraying of huts with DDT. In 1972-73, the EPA banned its use in the US on the false claim DDT caused cancer. The powers that be demanded it be banned world-wide. The tropical nations that did so, witnessed malaria cases soar. Tens of millions of humans have died, hundreds of millions reduced to misery, all based on false science. This creates an inter-generational negative externality whose resolution requires some wealth transfer (Coase Theorem). The specific question is: how much benefit to transfer from the near future to compensate the far future for their hurt? This appears a relatively straightforward non-renewable resource issue. However, there is a huge catch: economic growth is cumulative, and-unlike most non-renewable resources-there is no substitute for air. Thus, any carbon tax is broad-based and will likely decrease economic growth. Just like a savings account, the longer the time frame the greater the impact of a lower interest rate on the balance. Thus, a large part of the true cost of a carbon tax targeting the near future will “paid” by the far future in terms of accumulated lost economic growth. One could argue that, if properly designed, such a tax could encourage investment in and substitution toward new technologies. This would “spur” economic growth in a different direction. However, these arguments ignore the counter-factual. They are simply a clever re-packaging of the broken-window fallacy. I don’t agree that people who are worse off (the present generation) need to transfer wealth to people who will be better off (the future generation). There is no obligation on the present generation to make the world perfect (as if that’s even possible) for the future generation. Indur Goklany has a good analysis that shows how less-well-off present generations compare to more-well-off future generations, even after subtracting the costs of global warming that the future generations will incur. From Figure 3 of that paper, in the A1F1 scenario (which has the greatest global warming of the IPCC scenarios), the welfare per capita of the Industrialized countries in 1990 is $14,000, and the Developing countries in 1990 is $1,000. In the year 2100, the welfare per capita of the Industrialized countries $99,000, and the Developing countries is $62,000. In other words, even in the A1F1 scenario which has the highest global warming, the welfare of the Developing countries in 2100 ($62,000) is higher than the welfare of the Industrialized countries in 1990 ($14,000). So even to require the Industrialized countries of 1990 to sacrifice for the Developing countries in 2100 is to have the poor sacrificing for the benefit of the rich. Again, no generation has any legitimate claim that they should be born into a perfect world…that previous generations should solve all the future generation’s potential problems. An additional item that isn’t even covered by Indur Goklany’s article (and there’s no reason it should have been) is that the future generation could fairly easily, with their vast wealth, remove carbon dioxide from the atmosphere to get back to the pre-industrial level of ~400 ppm…and still have a higher per-capita income than we have today. Here’s an analogy about why I think the present generation is not morally responsible for eliminating global warming, so that future generations don’t have to deal with it. Suppose I have a house that I got from my parents. And suppose I added a lot of new rooms and appliances, new carpeting, and other good things. Suppose I give it to my chidren when I die. And suppose that right before I die, I crash the lawnmower into the air conditioning compressor outside the house, and totally destroy the compressor. Do I have a moral obligation to spend my money to fix the compressor before I give the house to my children when I die? No, I don’t think I do…and I think most people would agree with me. Global warming is analogous to that broken air conditioning compressor. We’re going to give our children and grandchildren a house (earth) and it will be better than the one we got from our parents (new rooms, new appliances, new carpeting)…except for that broken air conditioning compressor. We don’t have any moral obligation to give our children and grandchildren a perfect world. Simply giving them a better world than we inherited should be enough. One of many things that are missing in all of this is that a large percentage of CO2 comes from Coal. And almost all the Mercury in the environment is from Coal. Women are now advised to keep their tuna consumption to one can a week at the most. Here is a fact that no one seems to wish to discuss. ALL energy production has costs. You can get cheap energy ONLY by stealing it from your neighbors (see various african countries), or from the futre, by poisoning the environment in ways both known and unknown. Perhaps we should look at attempting to live in ways that to not involve poisoning the air and water. Or is someone here about to argue that all that airborne Hg is not a problem? Or that all those refineries and coal plants do not poison the local air, land and water? The modern energy era, where carbon-based energies substituted for 100% renewables, has been a boon for mankind. Benefits have been far greater than costs, and the last billion people without modern forms of energy need to complete the revolution. We need far more dense energy, not less. Alex Epstein is making an ethical case for fossil-fuel energy against Bill McKibben et al. His posts at MasterResource are here: http://www.masterresource.org/category/epstein-alex/. Your evaluation of his arguments would be of interest. Finally, what are the trends with pollution and resource availability? Human ingenuity has and will make energy more sustainable, not less, in market settings. Energy statism, to me, is the number one threat against energy sustainability.